The world’s largest shipbuilder Hyundai Heavy Industries said Sunday it has signed contracts to build vessels, including liquefied natural gas carriers, valued at $600 million over the past two weeks. 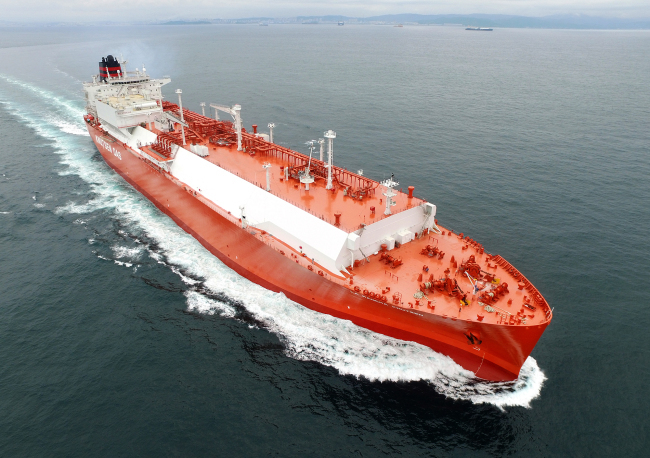 The Korean shipbuilder said it has signed a contract with a Greek company to build a 174,000 square-meter LNG vessel -- its latest deal in two weeks. HHI said it has signed contracts to make a total of five carriers, including LNG vessels, with Greek, Japanese and Korean firms. The names of the companies were not disclosed due to confidentiality reasons. The company said it will apply Hi-ALS, an air lubrication device developed by the firm in 2016, to the latest LNG vessel. Hi-ALS is an energy-saving system that improves sailing efficiency and reduces friction resistance by spraying air at the bottom of the hull. The company expects to save energy by 8 percent using this device. HHI said orders for LNG vessels are expected “to increase” amid growing environmental regulations and more contracts for vessels are “expected this year” as LNG projects in Russia and Qatar are predicted to pick up steam. The International Maritime Organization is slated to toughen emission standards for sulfur oxides -- harmful to human health -- from a vessel from the current 3.5 percent to below 0.5 percent from January of next year. According to London-based Clarksons, the global orders for ships was 32.3 million compensated gross tons last year, a 14 percent rise on-year. This is expected to reach 44.6 million CGT by 2023.